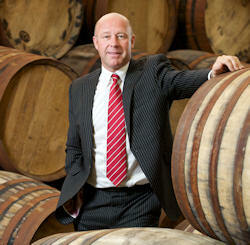 One of the world’s leading single malt whiskies, The Macallan, has unveiled Stuart MacPherson as its new Master of Wood. Stuart MacPherson joined the Clyde Cooperage in Glasgow in 1979, beginning his four year apprenticeship as a cooper, and rising through the ranks to become Cooperage Manager in 2001. Today Stuart oversees 16 production coopers, 3 apprentices and 7 service coopers, based at our 2 cooperages for the supply and repair of the oak casks, which are essential to the distinctive maturation character of The Macallan. He is responsible for the day to day running of the cooperage, production planning and ensuring that the distillery receives casks that meet our exacting quality standards. In assuming the role of Master of Wood for The Macallan, Stuart is the primary source of information on The Macallan’s oak casks and the influence on the whiskies. He is also involved in the far reaching brand education programme around wood. Stuart MacPherson takes up the role following the retirement of George Espie on 1st October 2012. Stuart lives in Lenzie with his wife Carol and son Scott. He is keen on all aspects of sport ranging from athletics to football however his main passion nowadays is golf.